Redirect Chat to Specific Departments | How to direct chats to specific departments? With ProProfs you can direct chats to specific departments (for example, Sales or Support) in order to streamline help service. Once you enable departments, a department drop-down list will appear in Visitor Chat Window (pre-chat form). This allows visitors to choose which department they want to chat with, resulting in a more streamlined approach. If you don't want to display department in pre-chat form, you can also use the department specific live chat codes on different web pages of your website. Step 1: Log in to your chat dashboard. 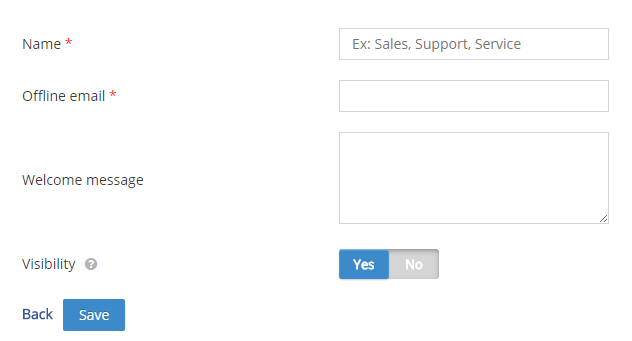 Step 2: From the header menu navigate to “Operators” -----> "Departments"
Step 3: Enable the department feature by switching the toggle button to “Yes.” Click the "Add Department" button to create a department. Note* The departments will only be shown to visitors if the "Visibility" is switched to "Yes". Step 5: To directly send chats to the specific departments copy the chat code of the department and place it under the ProProfs chat code on your website/webpage. (i) Click "Show Code" button to access the department's chat code. (ii) Copy the chat code (highlighted part in the below example). Note* After enabling chats for departments, make sure the existing operators are assigned to a department. Otherwise, the operators will not be able to handle any chats.